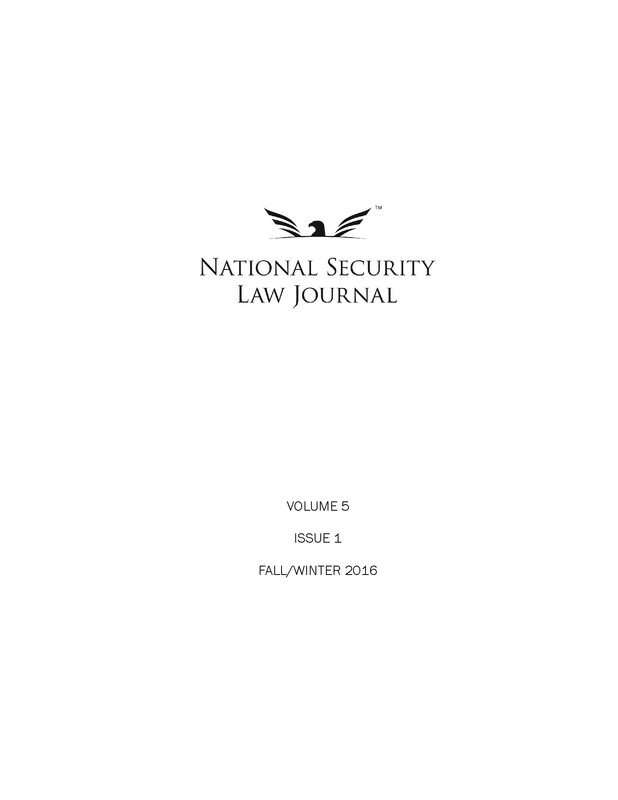 On November 1, 2016, the National Security Law Journal, in partnership with the George Mason University Association of Public Policy PhD Students, will host its fall symposium, Perspectives on the Responsibility to Protect Doctrine. The event will feature four panelists: Mr. Steven Groves, Senior Research Fellow at the Heritage Foundation, Mr. Christopher “Kip” Hale, international atrocity crimes lawyer and former senior counsel at the American Bar Association Center for Human Rights, Ms. Tahmika Jackson, Attorney-Advisor at the Department of Defense, and Mr. J. Trevor Ulbrick, Law Fellow with the Public International Law and Policy Group. Jeremy Rabkin, Professor of Law of the Antonin Scalia Law School at George Mason University, will serve as the moderator. The panel will discuss the Responsibility to Protect (R2P) doctrine, which was endorsed by all member states of the United Nations at the 2005 World Summit and serves as a global political commitment to prevent genocide, war crimes, ethnic cleansing, and crimes against humanity. R2P is based on the premise that sovereignty does not exclusively protect States from foreign interference; rather, sovereignty is a charge of responsibility that holds States accountable for the welfare of their people. This event will provide diverse perspectives on the R2P doctrine and its role in national security and international law. The event will be held on Tuesday, November 1, 2016, from 7:00 p.m. to 8:30 p.m. in the Founders Hall Auditorium on George Mason’s Arlington Campus, located at 3351 Fairfax Drive, Arlington, VA. Refreshments will be provided during check-in, which will begin at 6:00 p.m. Additionally, this event has been approved for 1.0 CLE Credits by the Virginia Bar. To RSVP for the event, please email symposium@nslj.org. Steven Groves: Steven Groves is the Bernard and Barbara Lomas senior research fellow in the Heritage Foundation’s Margaret Thatcher Center for Freedom. He works to protect and preserve American sovereignty, self-governance and independence as leader of The Heritage Foundation’s Freedom Project. Before joining Heritage in 2007, Groves was senior counsel to the U.S. Senate Permanent Subcommittee on Investigations. He played a lead role in the subcommittee’s investigation of the U.N. “oil-for-food” scandal, the most extensive congressional probe ever conducted of the United Nations. Groves previously was an associate at Boies, Schiller & Flexner LLP, specializing in commercial litigation. Before that he served as assistant attorney general for the state of Florida, where he litigated civil rights cases, constitutional law issues and criminal appeals, among other matters, in state and federal court. Christopher “Kip” Hale: Kip Hale currently serves as a legal advisor to a non-governmental organization conducting atrocity crime investigations in conflict zones. Until recently, Kip was senior counsel of the American Bar Association (ABA) Center for Human Rights in Washington, D.C., and also director of the ABA-International Criminal Court Project. Previous to this post, he was a prosecuting attorney in the Office of the Co-Prosecutors at the Extraordinary Chambers in the Courts of Cambodia (ECCC), and has done legal defense work and advised Judges at the UN-International Criminal Tribunal for the former Yugoslavia (ICTY) in The Hague, The Netherlands. Kip serves as a term member of the Council on Foreign Relations, on the Advisory Council of the Crimes Against Humanity Initiative and on the Council of Advisors for the Global Institute for the Prevention of Aggression. He has written on international criminal justice and atrocity crime accountability issues widely. Tahmika Jackson: Tahmika Jackson is an Attorney-Advisor with the United States Department of Defense. Prior to her current position, Ms. Jackson served as a JAG in the United States Navy where she held the position of Deputy Legal and Oceans Policy Advisor in the Office of the Deputy Chief of Naval Operations for Operations, Plans, and Strategy. In this capacity, she served as the office’s subject matter expert on legal policies pertaining to world-wide operations including law of the sea, sovereign immunity, maritime security, international law, litigation concerning US naval operations, national security and foreign warship visits. Ms. Jackson also served as Head of International Programs in the Navy JAG’s Office of International and Operational Law where she researched, drafted, advised and assisted in negotiations of international agreements concerning personnel and information exchange programs, interagency coordination, medical and marine research, classified programs and base support agreements domestically and abroad.